Enabling Access Permissions means that users will be required to log in to your site in order to be able to view course, lesson and quiz content. In most cases, you’ll want to enable this setting; however, if you aren’t using quizzes and want your course content to be freely available to everyone without registering, leave it unchecked. Allows learners to send private messages to the teacher from any course that they are enrolled in. You can disable this communication by checking this option. Sets the page used to display courses. Sets the page used to display the active and completed courses for a particular learner. Displays a placeholder image for any course or lesson that does not already have a featured image. Prevents Sensei’s CSS from loading, which effectively removes any default styling. This is useful if your theme already includes styling for Sensei elements, or if you prefer to style them yourself. Formats the display of the number of points a question has been assigned when a learner takes a quiz. Allows any HTML tags in the video embed fields. Enabling this setting can leave your site vulnerable to XSS attacks. We therefore recommend that you leave it unchecked. Deletes Sensei data when the plugin is deleted. Be careful! Once removed, this data can only be restored from a backup. Helps us make future improvements to Sensei by collecting usage tracking data. No sensitive information is collected. Once all the course lessons have been completed – Course won’t be completed until all of the lessons belonging to it have also been completed. Displays the course author on the course archive and My Courses pages. Sets the number of courses to display per page on the My Courses page. Displays each course’s featured image on the course archive page. Specifies the width (in pixels) of the image to display on the course archive page. Specifies the height (in pixels) of the image to display on the course archive page. Crops the image to the specified dimensions. If not selected, Image Height – Archive can be left blank and will be set proportionally to the specified width. Displays a course’s featured image on the single course page. Specifies the width (in pixels) of the image to display on the single course page. Specifies the height (in pixels) of the image to display on the single course page. Crops the image to the specified dimensions. If not selected, Image Height – Single can be left blank and will be set proportionally to the specified width. Displays the featured courses panels on the course archive page. Specifies the text to display for the link when there are more courses on the course archive page. Enables learners to comment on lessons for courses they are enrolled in. Only registered learners are able to view these comments. Displays the lesson author on the single course and lesson archive pages. Displays each lesson’s featured image on the single course page. Specifies the width (in pixels) of the lesson image to display on the single course page. Specifies the height (in pixels) of the lesson image to display on the single course page. Crops the image to the specified dimensions. If not selected, Image Height – Course Lessons can be left blank and will be set proportionally to the specified width. Displays a lesson’s featured image on the single lesson page. Specifies the width (in pixels) of the image to display on the single lesson page. Specifies the height (in pixels) of the image to display on the single lesson page. Specifies the name from which all Sensei emails are sent (usually your name or the name of your site). Specifies the email address from which all Sensei emails are sent. Specifies the URL of an image to display in the header of all Sensei emails (e.g. your logo). Specifies the text that is displayed at the bottom of all Sensei emails. Please see Email Notifications for more information. 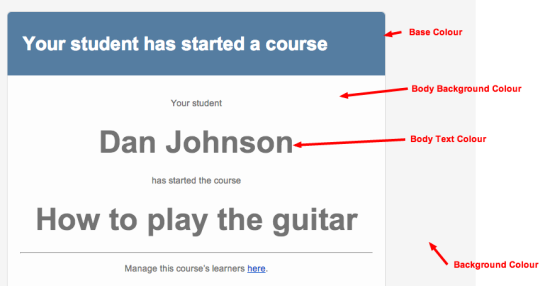 Creates a public profile page for each learner at http://yoursite.com/learner/username. Displays the learner’s active and completed courses on their profile page. Logs Sensei and WooCommerce events to WooCommerce > Status > Logs for easy debugging.